A simple but appetising egg omelette as starters. Gulai Ikan Tumis or sour and spicy fish curry. A dish for the 15th celebration day of the Lunar New Year festivities (the Chap Goh Meh) - the Pungat, made of selected fruit cuts, yam and carrots in a swirl of cooked coconut milk, rich but rewarding. The ingredients cannot be too soft when served and the whole dessert not overly sweet. With family in tow - and they had tried Gaik Lian's earlier through an introduction from one of my aunts in London - I already had expectations when we walked into the spacious surrounds of the cafe restaurant on a Sunday evening. I had phoned Adrian the son to book a table and he was most friendly making the table booking for me. There was a respite from the daily rain pour - vehicle parking was most easy on such an evening but it can be difficult otherwise on working days. The theme at Aunty Gaik Lian's was retro, practical and easy going. There were other tables filling up with more people that night. We wanted to sample what Aunty could offer. 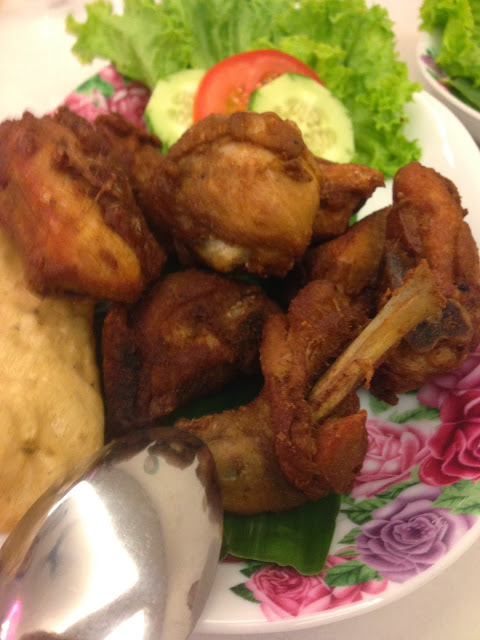 The Inche Kabin chicken, marinated in a recipe originated by a ship's captain and making use of both Western and Eastern ingredients, one of the modern world's first culinary fusion creations. The marinade is important, miss one ingredient and one can be caught out and such deep fried chicken is best served when still crispy. There is an old Honda motor bike displayed at the shop window and the kitchen is discreetly hidden away on the right hand side. A gentle and underlying reminder of yesterday in Penang was balanced by the quality and freshness of ingredients used. Aunty Lian is perhaps one of the best students of a well known cookery and Straits Chinese cuisine teacher from yesteryear - Mr Beng Yam. So the nuances and attention to detail, so significant in what separates good from ordinary Nyonya cooking, did show up that evening. Penangites are careful and critical about their food. 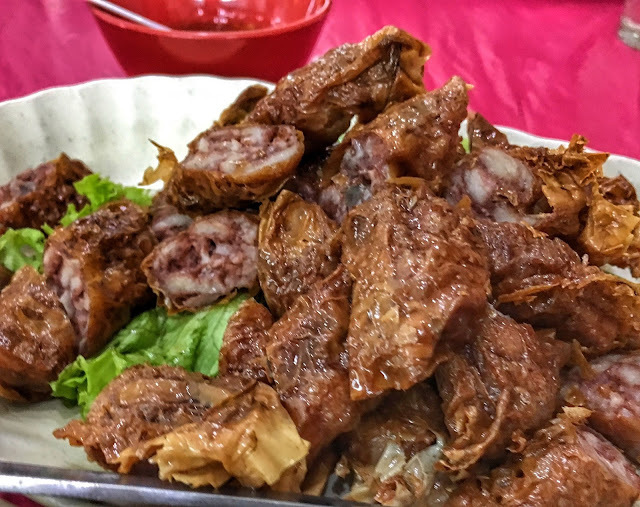 So the conversation inevitably went to compare the strengths and bite of Aunty Gaik Lain's Choon Pneih with those produced by her competitors at the CRC, Penang Swimming Club, the Littler Kitchen at Noordin Street and Mama's Nyonya Restaurant at Abu Sittee Lane. important dipping sauce (right of photo) which includes British Worchestershire sauce. Aunty Gaik Lian came out herself, to chat with the clientele and asked us of we wanted more servings of steamed rice. As the meal progressed, we were delighted to discover that Lian's husband is a classmate of my eldest brother and he could recognise each of us int he family. It suddenly brought me back good memories of being with all my brothers at home, me still growing up with vague but sure recollections of friends of brothers dropping by to visit. The menu is not extensive but sufficient, in my view. There are starters lined up and then several choices for the mains, with perhaps a limitation on curry options or dessert choices ,but servings are optimal and neither too little nor too much. You can look out on the street which has nightclubs nearby and the place is close to where both backpackers and cruise ship passengers can wander by. People doing the walking heritage trail in the old precinct of Georgetown can choose to have a lunch here as well. In the end, I reckon having a meal at Aunty Gaik Lian's is akin to being at home, partaking in dishes lovingly cooked by a close relative. Would I return? A definite yes. The dishes I had preference for had flavours, texture and a wholesomeness much to my taste. I particularly liked the Choon Pnieh and the signature egg omelette. Adrian could recommend dishes and their serving size to suit our numbers. Nothing was over salty or under whelming on the palate. Gaik Lian had generously provided us a special touch with the dessert. Tables were not packed too close like in some smaller establishments. I would be confident to bring both locals and visitors here. A cooling drink before dinner starts.